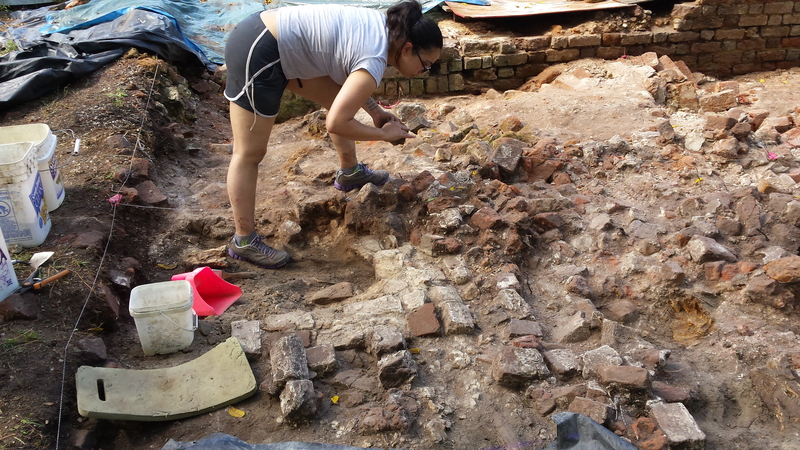 The following is a guest blog written by Fairfield Foundation volunteer and Adventures in Preservation workshop participant Evelyn Ayala, detailing her adventures during her first week of archaeological excavation and preservation work. 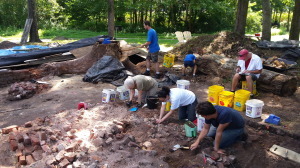 With the help of Adventures in Preservation, I spent a five-day week excavating and learning with the Fairfield Foundation. I’ll admit I was a little intimidated and nervous upon arriving. After all, it was my first field experience EVER. I am still very new to the archaeology field and had a lot of questions before I arrived. Did I pack the right clothes, was there any special equipment I needed to bring, where was I staying (coming from out of town), am I going to be the only one who hasn’t done this before, how many questions should I ask if I don’t understand before coming off like a dork, etc. (the list was long). Most of my questions were answered prior to arriving but some answers I had to learn on my own through the guidance of some awesome instructors. I have a deep passion for history and architecture and was able to experience both of my interests at Fairfield. The week started with the detailed retelling of Fairfield’s history by Thane Harpole (co-director/archaeologist). It helped give a meaningful understanding and appreciation of the site we were about to dig and the hopeful goals of what the outcomes might bring. The group was given excavation tools and the digging began. 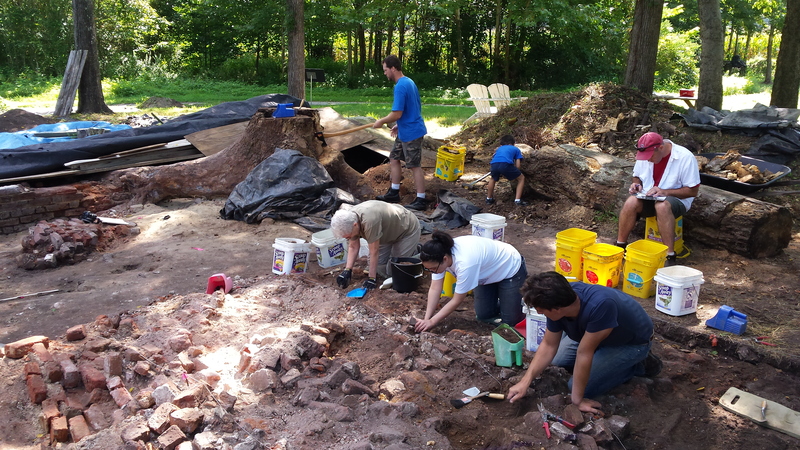 The second Adventures in Preservation workshop crew gets to work excavating the rubble from the collapse of the manor house! I was very apprehensive at first and scared I would do something wrong that might make the site vanish forever! (A little exaggeration but the fright was there). I had all my questions answered with expertise, patience, and overall friendliness by Thane, David Brown (co-director/archaeologist), and Anna Hayden (staff archaeologist). If I had a question they would stop what they were doing and take the time to explain the “how” and “why.” In a way this made me feel like I was more than a mere volunteer but actually starting to get a solid footing into a career field that I hope to get into. After a few hours I started to see the results of what I was doing and after a few days I started finding artifacts among all the rubble! 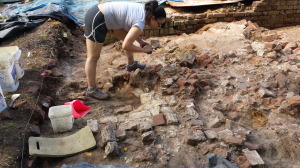 Evie works on carefully removing bricks that are no longer intact from the piles of rubble that accumulated after the burning and destruction of the manor house. By the end of the week I was so confident (but still a little scared) that the dirt was flying (not really!). Taking before and after pictures allowed me to see just how far I got within a few days and that I had actually made a difference. Sure, I made some mistakes but was corrected and moved on. 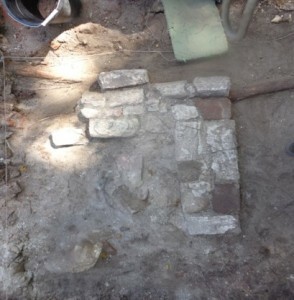 Evie began the week working on removing rubble from around this potential 19th-century porch support. Here the L-shaped porch support is more clearly evident after Evie’s careful excavation! 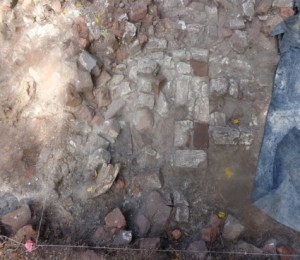 We were very lucky to discover this pier base, as the bricks that are visible represent the only surviving course. The week also included the teachings of a historic brick mason and maker, Jason Whitehead, who went over masonry techniques that I was able to put to use in helping to rebuild one of the foundation walls. How amazing it is to know that you physically put in a brick that (hopefully) will be there forever. 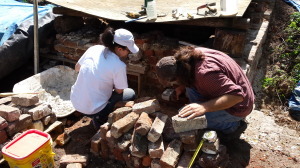 Jason guides Evelyn in some rebuilding and re-pointing efforts on a sensitive section of the original southwest corner of the 1694 manor house. 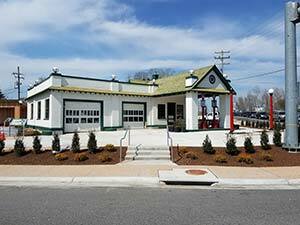 Other highlights included a demonstration of 3-D scanning by Dr. Bernard Means, an exclusive tour of the Jamestown church tower restoration by Bill Neff, a tour of the current Wren Yard excavation in Colonial Williamsburg/College of William and Mary, and a tour/workshop at the Edge Hill Service Station restoration project (the CAPE!) (where I got to paint the building – look at the green garage panels. Yup, some of that was me!). I was also hosted by the wonderful Tim and Janet Brown, who allowed me to stay in their home while on this field week. The entire experience was memorable and the best place I could have possibly gotten my first excavation encounter. Anna, Thane, and Dave are just wonderful at what they do and extremely knowledgeable. I met great volunteers and experts. I have been telling everyone about my time with the Fairfield Foundation and recommend this opportunity to everyone. I definitely plan to go back to see the progress and join the dig! Thank you to Evie for sharing her experience with us! If you’re interested in hearing more about this program, stay tuned for next year’s schedule as we continue to plan for AiP workshops in the summer of 2015!